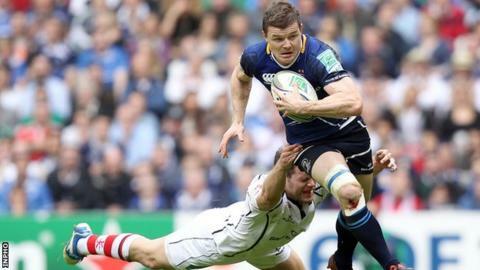 Brian O'Driscoll sounded an ominous warning to the rest of Europe as he insisted that Leinster will chase more glory after crushing Ulster 42-14 in the Heineken Cup final at Twickenham. O'Driscoll, 33, was speaking after Leinster secured their third Heineken Cup triumph in four years. "After we won the first we talked about not being content with that," he said. "We're now trying to create some kind of dynasty and something to be remembered." O'Driscoll added: "We're going in the right direction towards doing that. I know this team, they'll be hungry for more." "For the important part, the hard graft, people like Eoin O'Malley, sitting at home today having had his cruciate done yesterday, had a huge involvement." The Leinster squad will have an immediate chance for more silverware next weekend when they face the Ospreys in the Pro12 final in Dublin. The Ireland and Lions star, underwent minor knee surgery nine days ago, spoke of the importance of the squad ethic in Leinster's comprehensive victory over their Irish rivals. "We play for one another and that really showed out there," he added. "The energy from all 23 was phenomenal. The guys that came on were a couple of the try-scorers [Heinke van der Merwe and Sean Cronin]. "That speaks volumes about where we are as a squad." O'Driscoll missed the group stages of the Heineken Cup because of injury and he paid tribute to men such as Eoin O'Malley and Luke Fitzgerald who missed out on Saturday's decider because of injury. "For the important part, the hard graft, people like Eoin O'Malley, sitting at home today having had his cruciate done yesterday, had a huge involvement. "This medal is part his and likewise Luke Fitzgerald."